We had a fun potluck for our belated Thanksgiving, I made mashed potatoes and gravy, our academic director made a stuffed chicken. As I mentioned in the last blog it was postponed to the following Monday since students were gone on the Thursday of Thanksgiving. The best part about Thanksgiving is getting together and cooking together, and as you can see in the picture below, we are very proud of the chocolate cake we made. But if you are slightly suspicious about how stoked we look over a chocolate cake, I’ll admit that you might have reason to be suspicious. After all, it’s not that difficult to make chocolate cake, right? On the other hand, it is hard to make chocolate mousse. So the night before my friend and I had started making chocolate mousse, an old recipe of his mom’s, tried and true. I hung out while he worked and occasionally helped out when a few extra hands were called for. We beat the egg whites, melted the chocolate, everything seemed to be going well. Then the egg yolks were added to the chocolate, and for some reason the chocolate wasn’t remelting correctly, it was getting clumpier. Eventually we realized that by adding the yolk to the chocolate on the stove rather than the chocolate to the yolks on the counter, we managed to cook the eggs in the chocolate. Upon realizing this we stowed the well beaten egg whites* in the refrigerator and tried to figure out how to salvage the chocolate and egg yolks. Eventually, with the addition of flour, baking powder, a lot of sugar and some milk, our creation roughly resembled cake batter. We tossed it into the oven and crossed our fingers. Half an hour later (it was close to midnight at this point) we had a nice dark chocolate cake that tasted pretty good. We added a Nutella frosting the next day and voila! Chocolate cake for Thanksgiving dessert. Last week I went on a field trip with my Sustainable Agriculture class to one of northernmost kibbutzim in the area, Neot Semadar. We’ve visited this kibbutz before at the beginning of the semester but I didn’t add any pictures of it at the time. It’s a much different kibbutz from the others in the area in many ways, one of which being that it’s an extremely artsy kibbutz. This visit, however, was focused on learning about the sustainable agricultural practices on the kibbutz, namely learning about their goat herd and orchards. We also had the opportunity to taste their “artisan” cheeses at the end. While we were visiting the goats we were able to see these two kids. They’re two days old and absolutely adorable. We had another horseback riding lesson last Thursday, it was just me so one of my friends brought my camera along to take pictures. I rode our newest horse and the teacher worked with me on trotting. But wait! I know what you’re thinking: What about the hiking?! No worries. I did actually go hiking this week as well (my converse have taken over for my hiking shoes for the time being). One of the other students pulled a group of us together to watch the sunset from Electric Mountain late in the week and rather late in the day. As we headed out the sun was disappearing behind the mountains, it wasn’t that spectacular of a sunset but, because we had a full moon that night, there was a very cool moonrise over the Jordan mountains. And since just one hike sometimes isn’t enough, the very next day I headed out on a hike again. This time was a much longer hike, though we started with Electric Mountain, we ended up being gone for about five hours in total. I went with the “Mashav Course” which is a group of water professionals who are at the kibbutz for a few weeks learning about water management in arid environments. They’re from all over the world and we’ve had a lot of fun getting to know them over the last week. This hike was organized by one of the interns who invited the students along as well since we all like hiking. It ended up working out well as we were able to split into two groups, one groups went back down Electric Mountain and back to the kibbutz, the second group stayed with myself and another student and continued onward along one of the routes that I’ve been meaning to show my friend for awhile. And now we get to the reason behind the title of this post. 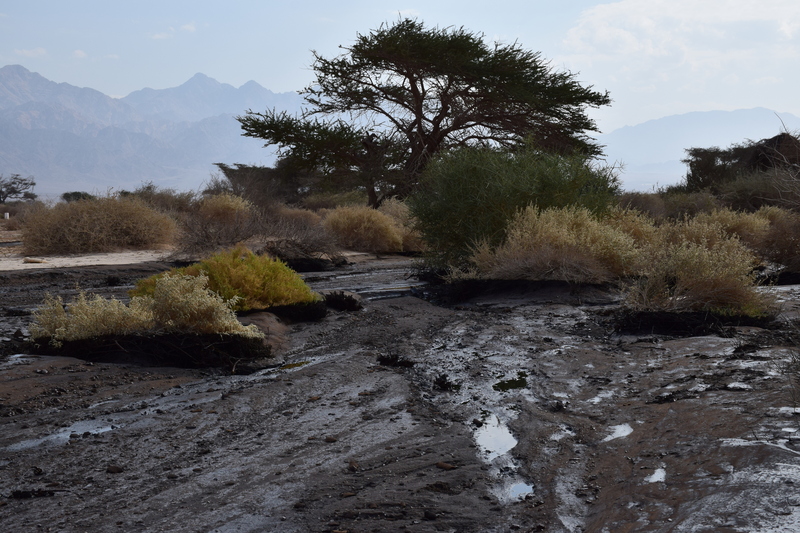 So last week there was a huge oil spill across from the only town around here that’s not a kibbutz (Be’er Ora). Our professor speculates that it was caused by maintenance workers who hit a pipe while working on stuff for a new airport they’re building down here. 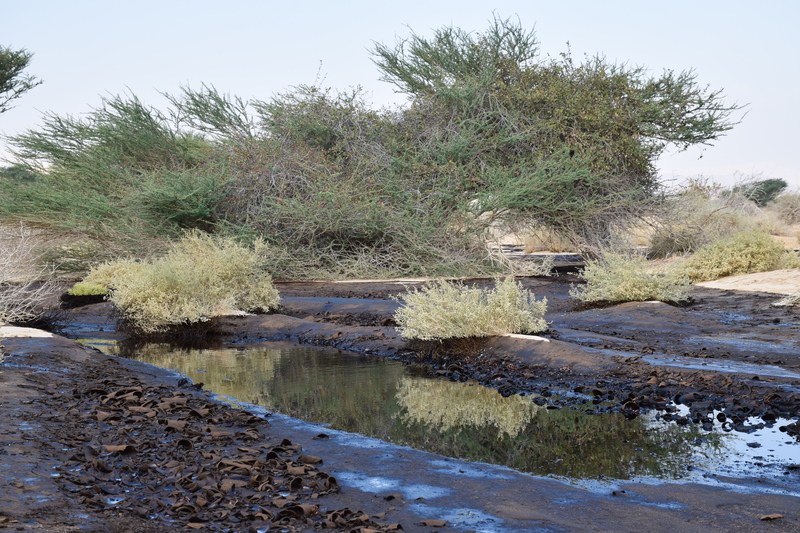 In any case, thousands of gallons spilled into the wadi causing lots of streams of it to flow towards Jordan. Update: Here are the specs of the spill — 5 million liters of oil, 200 meters wide, 7 kilometers long, 1 meter deep. It covers about 1000 square meters of the Evrona Nature Reserve (about 1/15 of the reserve). Streams that must be vaulted when attempting to mark trees in the area. 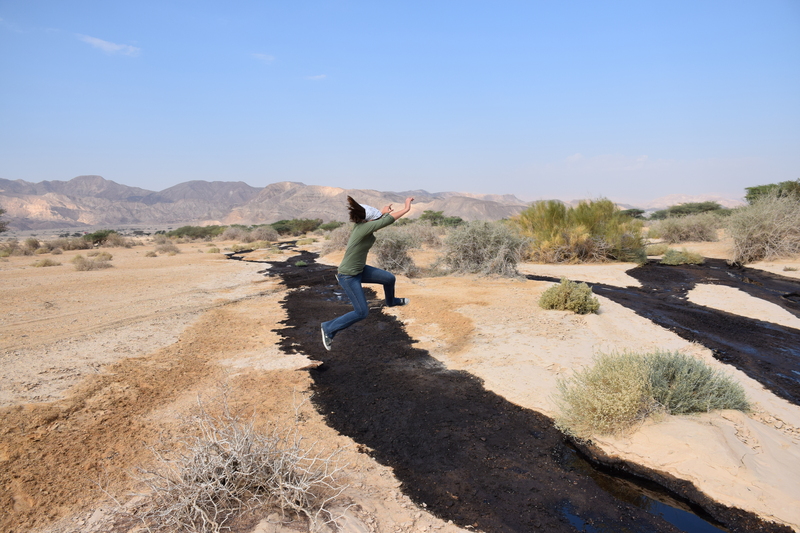 My friend and I contacted our professor after learning that he was going out to the spill to monitor the acacia tree responses to the oil. 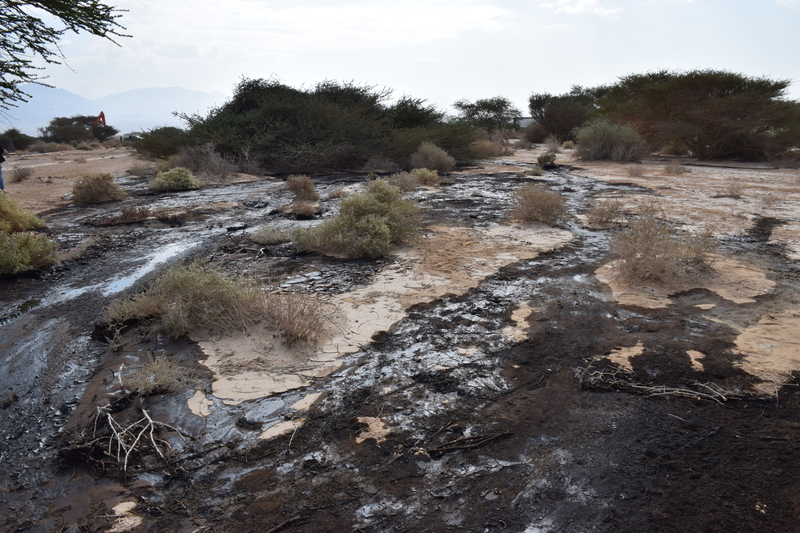 He brought us out to the site where we helped mark acacia trees and survey the damage. As you can see quite a lot of oil was spilled. We found this little guy crawling out of the oil spill and I was able to catch a picture of him before he went on his way. 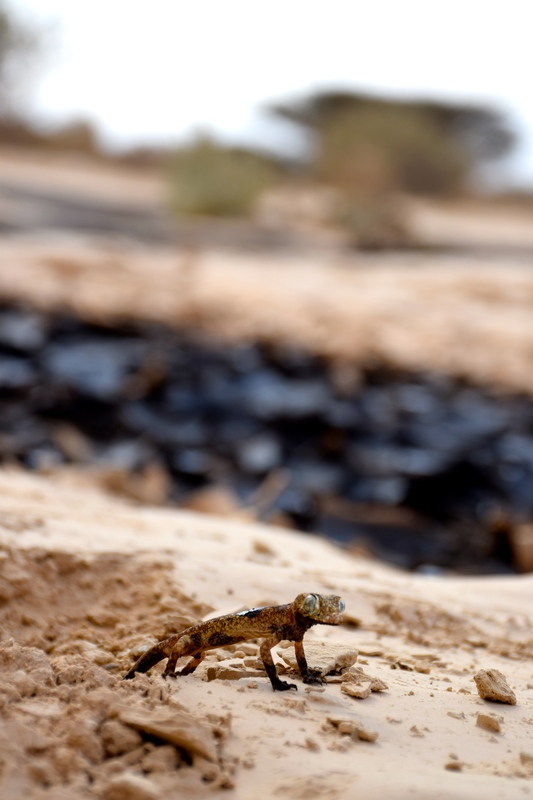 He’s a gecko who lives here in the desert, his feet and tail stub are covered in oil. I do have to say that my picture of him feels a little cliche, after seeing so many pictures of oil covered birds I now have my own picture of an oil covered animal. But to end on a happy note (which is always important)! I made myself crepes for breakfast on Saturday (as there is no breakfast on Saturdays) and left one for my friend. He was so excited that we made dessert crepes the next evening, and the next. Who knows if “pancake night**” will become a longstanding tradition or not but for now it’s certainly tasty! 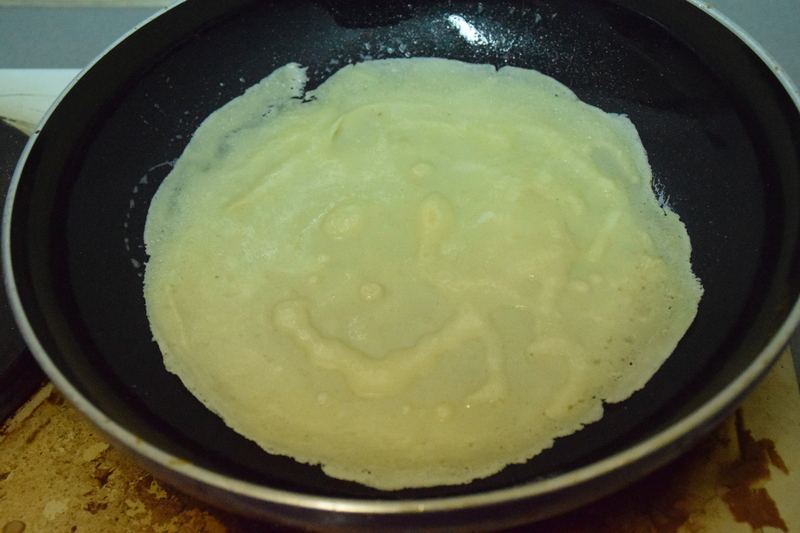 And occasionally, when I get creative, the crepes are very happy to see me :). #datkibbutzlyfe: Hitchhiking is totally a thing in Israel, in a way that it’s totally not a thing in the US. I wouldn’t dream of trying to get around by hitchhiking in the United States and I don’t pick any hitchhikers up for fear of them carrying a gun. But here in Israel everyone hitchhikes. And so my friend and I found ourselves in Yotvata with no ride home (we’d taken a kibbutz shuttle to get there but they stop running after noon). We knew there would be a bus coming through around 2:45, but that was about half an hour away so we stood at the bus stop and stuck out our thumbs (I say that metaphorically as here you actually hold out your hand rather than giving the drivers a thumbs-up). We didn’t have much luck, lots of cars passed and a few semis and no one seemed to want to stop. Jokingly, I told my friend how funny it would be if I was able to get a semi truck to stop, and it does seem that occasionally the universe hears me because the next semi that passed us saw me, pulled over and offered a ride to one of us. Unfortunately he only had one empty seat. We sadly declined and headed back to the bus stop. About ten minutes later the bus picked us up and took us back to the kibbutz and I headed to class. So the true hitchhiking adventure will have to be saved for another time. *Egg Whites: I didn’t forget about them. The next morning we pulled the egg whites out of the refrigerator and found that they hadn’t stayed beaten at all. While my friend began melting the Nutella (we figured we’d add that in instead of the mess we’d made yesterday and it would work just as well) I started whipping the egg whites back to the nice foamy texture we’d had yesterday. We eagerly mixed the two, crossed our fingers and put it back in the refrigerator. Unfortunately, two days later, the top half of the mousse had turned into a delicious pudding but the bottom half had reverted to being just egg whites. We decided that it wasn’t meant to happen and enjoyed the part that had become pudding. **Pancake Night: So one of my friends is from Belgium and speaks French and has explained to me that the english translation of crepe is “pancake” and the thing that Americans call pancakes are actually “American pancakes.” Therefore, if we’re discussing crepes (which he winces at every time I say it due to my lovely pronunciation) we should be discussing pancakes vs. American pancakes. So “pancake night” actually consists of crepes and they’re totally delicious: a crepe by any other name still tastes as sweet.